Stretch your pennies: Real bread but Gluten free and at a reasonable cost! Real bread but Gluten free and at a reasonable cost! In our household we have one person why has a mild intollerance for wheat. In everyday life this isn't too much of a problem but eating bread and cakes made him really poorly. He really missed bread and the gluten free options available in the supermarkets didn't really tick the boxes. Before he found wheat free bakery direct, he used to get his bread from marks and spencer. He found it palatable especially if toasted but didn't really like it for sandwiches. It was not cheap at around £3.50 a loaf. Then he found wheat free bakery direct it was a revelation, in fact I've never seen someone so excited about a bread roll! Once he had found it, it was just a matter of going through all the options and trying them out. He's yet to find any that he doesn't like as yet and has started ordering direct and freezing as the breads all freeze and defrost very well. Ordering directly really lowers the cost from just £1.99 per loaf. 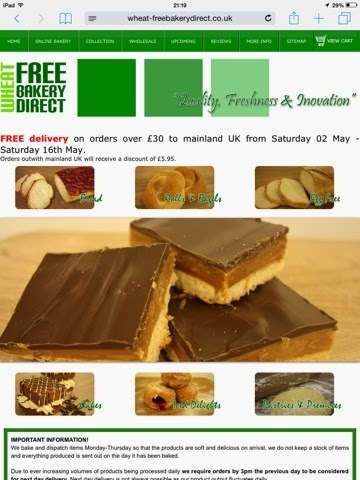 Currently there is free delivery on all orders over £30 so it's the perfect time to stock up your freezer.